The Brown scapular, a Sacramental, is an outward sign of the protection of the Blessed Virgin Mary, Mother of Jesus and Mother of all believers, who was given to us by Jesus on the cross. The scapular consists of two pieces of cloth, one worn on the chest, and the other on the back, which are connected by straps or strings passing over the shoulders. By His Passion, Death and Resurrection, Jesus Christ has redeemed us all, delivering us from sin and restoring us to grace. He gave us His Mother to be our mother. Like any good mother, she fights for her children, zealously watches over them, protects them from harm, and promotes their well-being. She wants to help us find Jesus, and follow Him to eternal life. The scapular is a sign of Mary's patronage and protection. 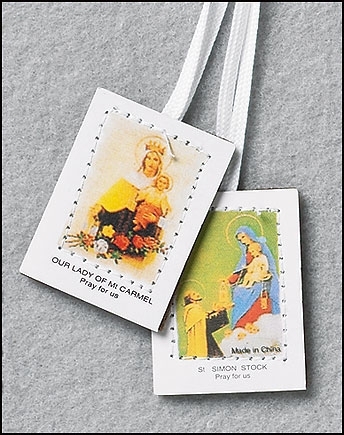 This scapular comes with a full-color image of Our Lady of Mt. Carmel on one panel and an image of St. Simon Stock on the other.